The Augustinians first came to the United States in 1794, and settled in the Midwest in 1905. The Province of Our Mother of Good Counsel was officially founded in 1941. Even so, the Augustinian's history as a religious order dates back for centuries. In the early years after the United States had been established as an independent country, the population was widely scattered. There were few priests to minister to Catholics. When Bishop John Carroll of Baltimore appealed for priests to come to America, the Augustinians of Ireland sent Rev. John Rosseter, O.S.A., who arrived in Philadelphia in 1794. Bishop Carroll was so pleased with Father Rosseter's ministry that he asked the Order of St. Augustine to send additional friars and to establish a permanent community in the new republic. Rev. Matthew Carr, O.S.A. was assigned to the new mission field. He arrived in 1796 and made Philadelphia the center of Augustinian missionary activity. As their number grew, the Augustinians expanded their presence and ministry to neighboring Eastern states. Rev. James F. Green, O.S.A. 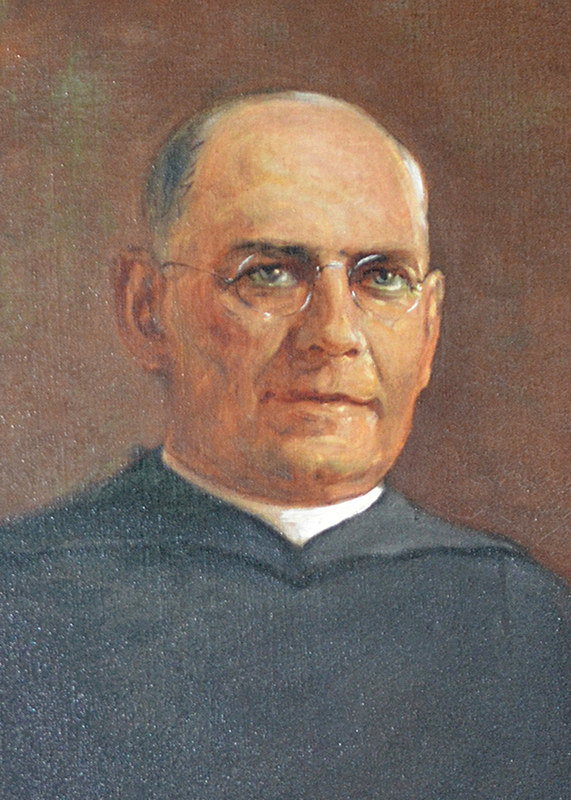 In 1905 Archbishop James E. Quigley invited the Order to Chicago to start its first foundation west of the Appalachian Mountains. Rev. James F. Green, O.S.A. went to Chicago later that year. He was asked to establish a Catholic presence in the sparsely settled southwest section of Chicago. Three months later, construction was started of a church, school and monastery. The buildings served the newly established St. Rita of Cascia Parish and St. Rita College (now called St. Rita of Cascia High School). As the area population grew, the Augustinians established three additional parishes in nearby neighborhoods in 1909: St. Clare of Montefalco, St. Nicholas of Tolentine, and St. Gall. St. Rita of Cascia Parish moved from the high school campus to its own building a few blocks west in 1916. Bishops of other midwestern dioceses began inviting the Augustinians to establish communities and serve the Church in their territories. The Augustinians then assumed responsibility for three parishes in Michigan: St. Augustine Parish in Detroit, St. Clare of Montefalco Parish in Grosse Pointe Park, and St. Matthew Parish in Flint. Cascia Hall Preparatory School was founded in Tulsa, Oklahoma as a Catholic High School in 1924. The Augustinians also began serving other Illinois foundations such as St. Thomas High School and St. Mary Parish in Rockford, and Fox Valley Catholic High School in Aurora. By the late 1930's there were nine houses and 60 Augustinians serving in the Midwest. The time was right to establish a new Province in the central United States. Thus, the Province of Our Mother of Good Counsel was born April 26, 1941. Two months later, the first Province Chapter was held. Rev. Ruellan P. Fink, O.S.A. was chosen as the first elected Provincial of the new Province. The Villanova (Eastern U. S.) Province continued for several years to send five friars annually to the Midwest. Together with young men from the Midwest who joined the Order, the Province grew steadily. First building of St. Rita High School and Parish, Chicago. This first foundation of the Augustinians of the Midwest was constructed in 1905. The Augustinians of the Midwest have traveled to foreign lands to bring the Gospel of Jesus Christ. Three Province members served in the Augustinian mission to Japan, started in 1952 under the joint sponsorship of the Midwestern and Eastern Provinces. After a request in 1963 from Pope John XXIII, the Augustinians of the Midwest accepted responsibility for the newly created Prelature (now Diocese) of Chulucanas in northern Peru. Most Rev. John C. McNabb, O.S.A. served as its first Bishop; Most Rev. Daniel T. Turley, O.S.A., currently serves as the Bishop of Chulucanas. As more Peruvians have joined the Augustinians, a Vicariate (a group of Augustinians on the way to becoming an independent Province) has been established in the north of Peru. Several Augustinians of the Midwest and Eastern Provinces continue to live and minister in Peru. As of May 2016, the Midwest Province of Augustinians has 76 Augustinians in solemn vows and 14 men in formation.